We are pleased that you are interested in joining our team. Camrose Association for Community living is a non-profit organization that helps people become an accepted and participating community member. CAFCL was founded over 50 years ago by parents of children with disabilities. We have grown to an organization that currently provides support to adults with disabilities, adults with an acquired brain injury, families at risk and children with special health and development concerns. • All employees belong, are valued and contribute to all aspects of the organization. • Relationships are important, healthy and positive. CAFCL is looking for people with enthusiasm, integrity, and flexibility. If you’re passionate about helping people with disabilities reach their full potential. A supervisory level position which is designed in the career progression as broader organizational leadership. While there may be some direct service coordination issues, the role is primarily operational oversight. They have key responsibilities in training and supporting front line staff and delegation of tasks. They act as a team resource for relevant policies and procedures, a liaison between front line employees and senior management, and work on collaborating with all stakeholders to ensure quality services for those accessing support. They have key responsibilities in monitoring and evaluation of service delivery. The Community Disability Services Worker (CDSW) is a front-line community disability services role responsible to support and facilitate the development of skills and competencies in order for individuals in service to pursue and fulfill their goals, objectives and aspirations. Task/activity specific reporting to a more experienced support provider. This position is key to developing independence, promoting community inclusion and building connections for people to be successful. Healthy Families Facilitators work in partnership with families who are expecting (prenatally) or have infants/children 0-3 years of age. The Community Disability Services Practitioner (CDSP) is an experienced knowledgeable direct support worker to individuals with disabilities. They participate in assessments, person-centered planning and plan implementation. The role requires specialized education, extensive experience and knowledge. The focus will be on areas of service, mentoring, coaching and managing less experienced co-workers, but without full supervisory duties. It is the first step into organizational leadership. Charity Auction Event: Involves a number of hands-on tasks such as setting up supplies for the event, decorating the few days before the event, helping with on-site activities, cleaning up after the event –just to name a few! This commitment could be a few hours of your time or a couple of days depending on what works for you. We are always looking for individuals that have passion for something whether it is painting, wood working, knitting, baking, photography etc. Our individuals would love to have an opportunity to learn new things and we need people like you to take the time and teach them. Healthy Families is looking for volunteers to assist with child care every Tuesday mornings from 10-11:30 and for one or two afternoons per month. Criminal Record check and Child and Youth Information Module check are required. Would you like to help out on day trips for summer camp? Can you Make a snack for the kids to enjoy? We require a snack every day of the Summer Camp program from Wednesday July 2 – Friday August 22. “I work at CAFCL because I believe it is an amazing agency to work for. The support we receive as staff from our CEO, Directors, Managers and Supervisors enables us to continue to support the individuals we are serving. My work allows for me to watch struggling women grow into strong advocates for themselves." "Working for CAFCL makes me feel valued and appreciated that’s why it reflects on the clients I support. I’ve never worked with excellent staff and management for the 8 years I’ve been here in Canada until I became part of CAFCL. I’m very blessed and happy to be a part of your team." "In June of 2009, I started volunteering with CAFCl, more specifically with one of their clients, a Mr. Rodger Orr. Usually, every two weeks, Rodger and his caregiver drive out to my place where I live in the country - about a 15 minute drive east of Camrose. 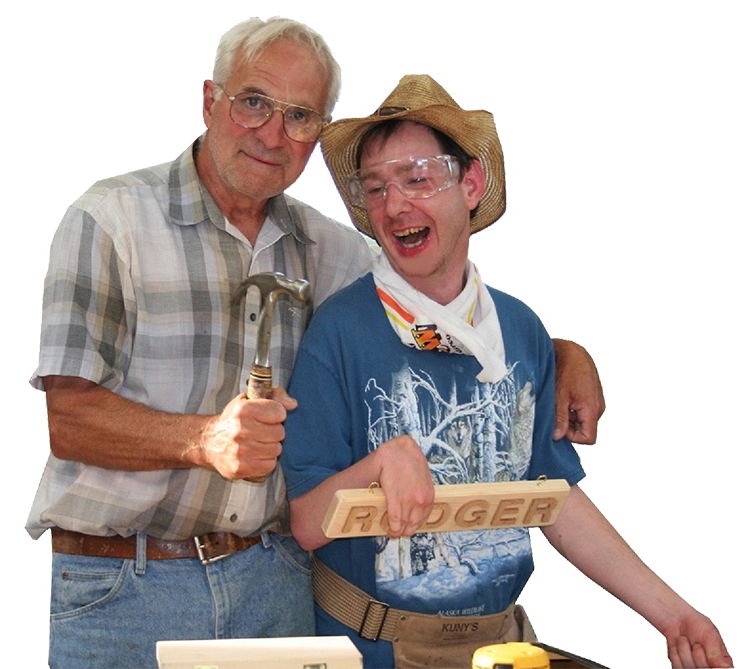 In my workshop, together we build a small woodworking project that he can take back with him to paint and then use or give as a gift to someone. Our relationship, started out as, what I thought of at the time, a way I could donate my time in helping someone, perhaps in some ways, less fortunate than myself. Was I ever wrong - I believe I have grown and learned so much from Rodger. Rodger cannot speak but he has taught me that you don't need words to communicate. He has taught me that you can accomplish many things in life without having full use of and control of your body and that you can also be happy at the same time. Their measurements of joy in their lives may be different than 'ours' but they are still joys - and I see many of them in Rodger. He has made me realize how trivial and needless are my complaints in life. He has added so much to my life values that it will be very difficult to repay him. Thank you Rodger. I also want to thank CAFCL, their staff and caregivers for the work and dedication they do to make so many more lives valued and in the forefront. It takes a very special kind of person to carry out the tasks of a caregiver, and I for one have a great deal of admiration for what they do - I say thanks to them all. "